Convenient laser levels, allowing you to accurately perform marking, and are willingly acquired by professionals and amateur masters. After all, smooth bright lines drawn by a laser are perfectly visible even at a great distance. But a person without experience may be asked how to use the laser level correctly. Read about it in this article. Before you start using the device, you must clearly separate with what type of laser levels you have to work. 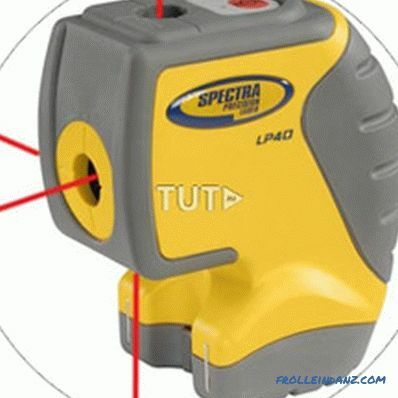 Although if you bought this device yourself, then you should have known about it even at the stage of choosing a laser level. 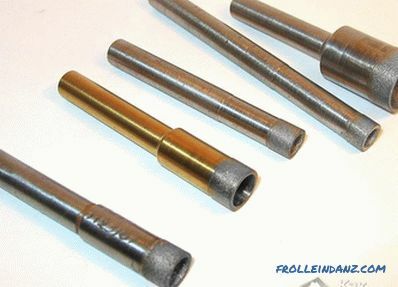 Static line plotters ( other names - cross-liner or multi-prism builder). Rotary line plotters (other names are multi-prism builder, level). Static plotters of axes (other names are pointer, point laser). In principle, most manufacturers write in the instructions (usually included in the kit) how to prepare the device for operation. As a rule, no special "dancing with a tambourine" is required - everything is simple and clear. If the model is of battery level, then you must charge the battery before using it. If the device runs on batteries, then insert them into the power compartment. We check the performance level by turning it on. If a laser beam appears, then everything is in order. You can start the installation of the device. Step 1. There should be no obstacles along the path of the laser beams. Otherwise the refractive effect will interrupt the projected line. Step 2. 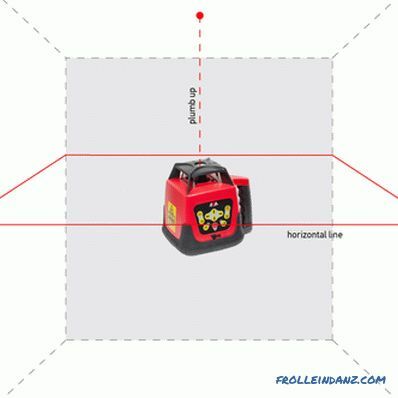 The laser level should be located at the optimal distance to the object. The permissible maximum is specified in the instructions, and should not exceed it. Reducing the distance reduces the probability of error, so if possible, try to put the device closer. The permissible maximum can be increased by using a special receiver of the rays. This option is used when the object is at a great distance. Step 3. 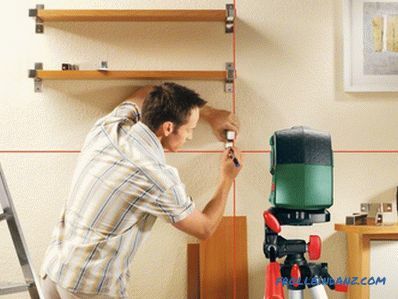 During operation, the level must be on a flat plane (the table surface will fit), a tripod, or a special holder. It should be securely fixed, since the complete immobility of the device is a guarantee of obtaining accurate data. No shaking or movement is allowed. Step 4. Before starting the measurements, align the level with the horizon. To do this, use the bubble level built into the device. A number of models have a self-leveling function. It works like this: as long as the device does not stand straight, a signal is given. No signal means that everything is fine and the device is installed exactly. Step 5. You must first warn nearby people about upcoming work. Animals should also be led away or carried away. After all, the accidental hit of a laser in the eye can injure them. Step 6. That's all the recommendations. When they are met, you can turn on the level and perform the necessary work. The instructions for your device also contain information on how to set up the device correctly. The manufacturer describes this process in some detail, but not always clearly. 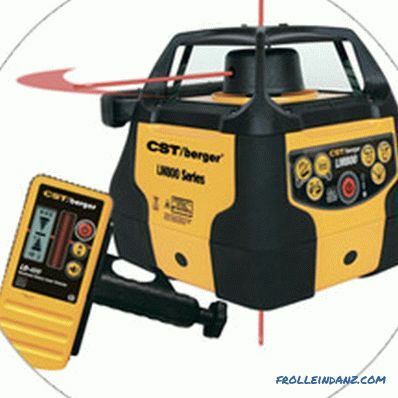 In general, laser level tuning is a standard procedure for most models. Let's start with the simplest levels. Usually they have two or three bubble levels - according to them, these devices should be configured. This is done by tightening the screws. However, even if the device is equipped with a self-leveling function, this does not mean that it really aligns itself. This will happen only with a tiny deviation - no more than 10 - 15 degrees. When the surface is more uneven, you have to manually tighten the screws (as when working with the simplest device). 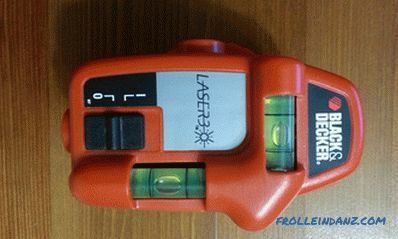 A prism-type laser level allows, during operation, to create two beams projecting vertical and horizontal lines onto an object. They can be radiated simultaneously, and it is also possible to choose only one of them. In addition, some models create plumb lines and laser points (zenith, nadir). They can also be turned on and off. 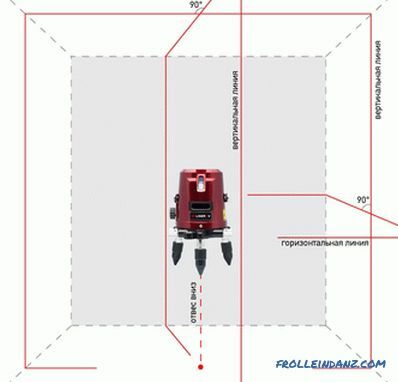 And the rotary laser level, in addition to the above, has two more settings.This is the magnitude of the scan angle and the speed of rotation of the laser beam. At the same time it projects the beam only in one plane, but some models can project the vertical axis. Professionals, giving advice on how to work with a laser level, recommend using only the currently required functions when using it. For example, when it is checked how vertical the doorway is, the horizontal component is completely useless. It is quite possible to leave only the vertical beam - and the battery will last longer, and less energy is used up. 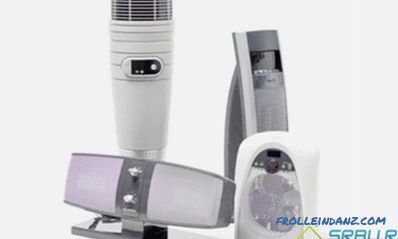 Receiver of laser radiation can help you very much on the street. With it, you will see a distinct projection of the beam, even in blinding sunlight. And the distance that the laser “gets” will double. 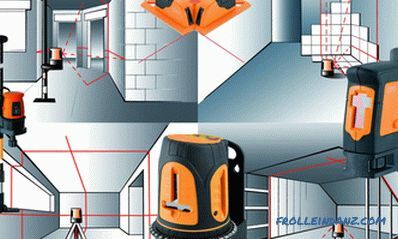 Just buy both the laser level and the receiver of the same manufacturer, otherwise there are cases of incompatibility of devices of different brands. If your level is not designed to work with the receiver, then in this case you can find a way out. There is a very simple device - a reflective plate. By fixing it on the object, you can get some increase in the range of the beam. 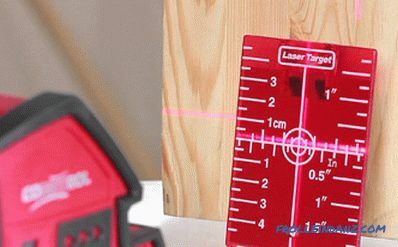 Target is a simple accessory that comes with almost all laser levels. A plastic plate with concentric circles drawn on it looks exactly the same as paper targets for shooting, issued in a dash. After all, the goal of both of these targets pursue one - to get into the "bull's eye." 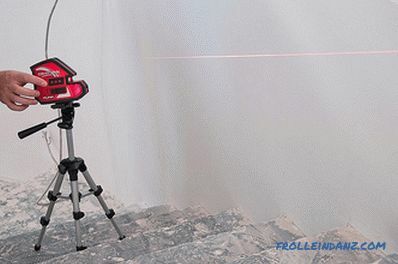 Well, you can shoot not only with bullets, but with a laser beam. Such a thing is very useful when the distance between the level and the object is large enough. For example, you need to make a hole in the wall a few centimeters higher than in the opposite, while the distance between the walls is 40-50 meters. Try to see at this distance traces of a pencil or marker! If, however, fix the target instead, then aiming at it with a beam is not difficult. Even if the shooting is not very accurate. 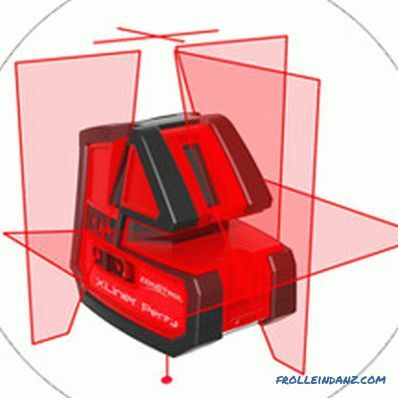 Some levels have one more device in the kit that improves the accuracy of the laser “shot”. This is a kind of optical sight, located on the body of the device. It is called an optical sight, and with its help you can easily “reach” the target, even at a hundred-meter distance. Rake is useful when you need to draw several parallel lines on the surface of the object, the distance between which is the same. And with the help of the rail, they change the height of the level fixed on the tripod. Then he can return the original position. 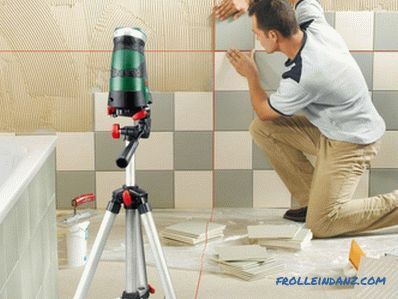 By asking an experienced master how to use a laser level, you can learn that you can use this device almost everywhere. And the boundaries that determine the possibilities of its use are the boundaries of your imagination. And now - a little specifics. 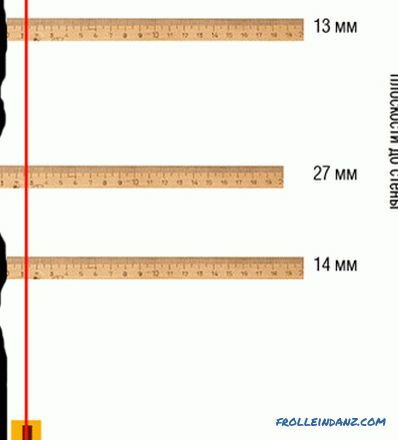 This particular area of ​​application clearly shows how outdated various rulers, tape measures and bubble-type levels are. To find out how flat your floor or wall is, you need to send a laser beam along their surface. At the same time along the wall (if we check the wall) we put several check marks. The line drawn by the beam will show the deviation from the vertical in each mark. In accordance with these data, we select the thickness of the leveling layer at all control points. We turn on both beams - vertical and horizontal. Intersecting, they project a cross on the wall of the object. We combine the center of this cross with the central seams at the tile we are laying. And along the lines of laser beams align the sides of the tile. 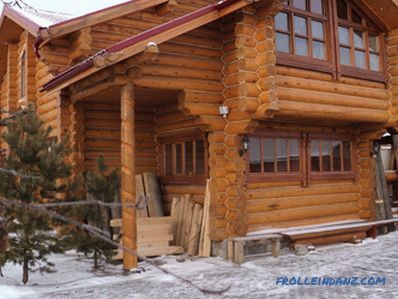 Not all elements of a house consist only of horizontal and vertical lines. Sometimes the designer wants to experiment with the planes located at an angle. When implementing such bold projects, the laser level will be most welcome. Read the instructions for your instrument carefully and you will understand how to make the beam go at an angle. In those levels where the automatic leveling system is used, it is necessary to turn on the lock of this system. 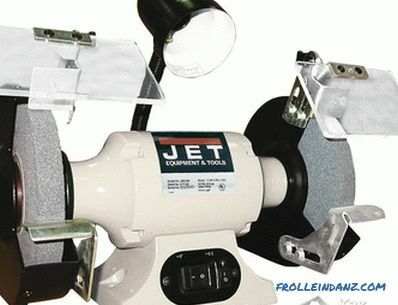 Some levels are equipped with a system for automatically changing the angle of the beam. For example, if you disable the tilt compensation lock, then it is quite possible to fix the level on a tripod at the angle that is required. The laser beam will be inclined. And a laser level will be useful for this simple operation. So by turning on the vertical beam, we can easily align the vertical edge of the wallpaper. A horizontal beam will help to make the perfect curb, which without the use of a tool often turns crooked. An irregularly hanging shelf or a wall cabinet can cause a lot of frustration - they spoil the whole look of the room. Of course, you can outweigh them using a normal bubble level or even a ruler. But it is long and troublesome. Whether business - a laser level. He and the cabinet will help to install exactly, and hang the eaves, and the built-in appliances accurately positioned. The main thing - all this is done very quickly. 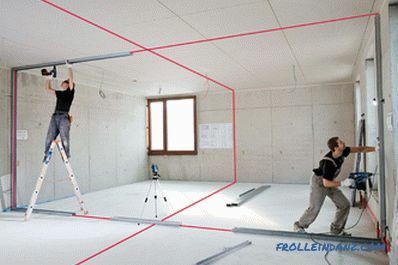 Having a laser level, you can “redraw” the room in a short time. To mark the location of partitions, do not have to take a stepladder or crawl along the floor. It is enough to make a projection of the laser beam in the place where the future partition will be located. Directly to measure something with a level will not work. But he can greatly facilitate and accelerate this work. Take, for example, a room whose walls are not vertical. If you need to know its height, the problem arises - do not do this along the wall. It's a good idea to use a laser range finder, but it may not be. 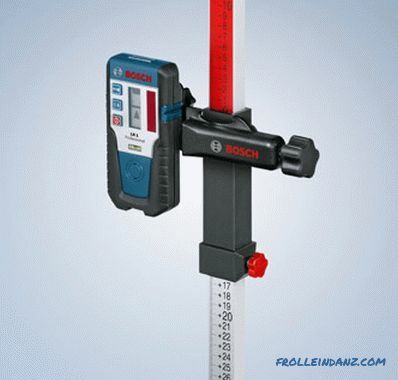 If there is a laser level that projects a plumb line, then it can also help. Having received at the same time two points - on the floor and ceiling - we take a tape measure or a ruler and measure the distance between them. It turns out a very accurate height of the room. It would seem that there could be a dangerous thing in such a harmless thing. However, the power of the laser beam used in this device is quite high. Otherwise we will not see it in the daytime, in the light of the sun. Therefore, remember that the beam should not fall into the eyes of people or animals. And while working, always wear safety glasses - with them, by the way, and the beam is better visible.